Lock in a great price for Wateredge Inn – rated 9.3 by recent guests! Comfy room, great breakfast. Some good beers in in the bar and some friendly holidaymakers. The cleanliness of the room and the politeness of the staff. The room was lovely and the bed so comfy. The bathroom was excellent very clean. Everything else was great, superb location, friendly staff, lovely clean and spacious room. Wateredge Inn is an ideal place to stay right in the heart of Ambleside town. 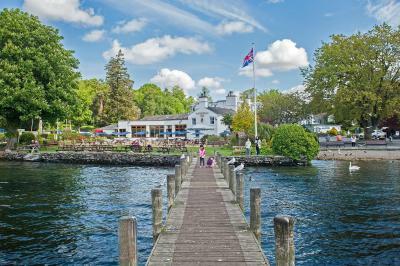 The Inn is located right infront of Lake Windermere. We had the best view from our room. The facility is pet friendly, clean and staffs were superb from day one. Highly recommended. Everything was amazing; the location, the view, the room and the breakfast far exceeded our expectations! Quaint bedroom with very comfortable bed. Convenient access to hotel from car park. Excellent varied menu and all meals were well cooked and presented. Top marks for the staff. They are friendly and efficient, nothing too much trouble for them. Wateredge Inn This rating is a reflection of how the property compares to the industry standard when it comes to price, facilities and services available. It's based on a self-evaluation by the property. Use this rating to help choose your stay! One of our top picks in Ambleside.Wateredge Inn stands on the shores of Lake Windermere, a short walk from Ambleside center. Set across two former 17th century fishermen's cottages, it offers cozy bedrooms and period features. The individual bedrooms each have an private bathroom and tea and coffee facilities. Rooms also have a flat-screen TV, hairdryer, and a comfortable seating area. Many rooms feature lake views and some have lake view balconies or garden patios. A traditional full English breakfast is served daily. The popular bar and restaurant serves seasonal local produce and local real ales. Guests can enjoy the log fire, lake views and outside terrace and gardens. 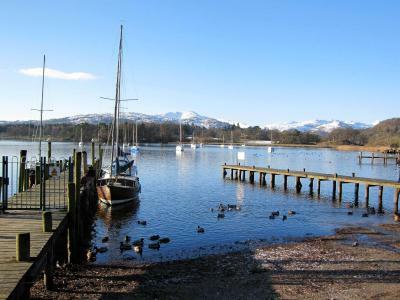 Surrounded by beautiful lakes and mountains, Wateredge has its own boat slipway and jetty and is just yards from the steamer pier for cruises down the lake. While staying at the Wateredge Inn, guests can make use of a local leisure club with a swimming pool. The inn is also close to popular walking tracks and cycle paths. When would you like to stay at Wateredge Inn? These spacious double bedded Garden Rooms are just a short stroll across a small courtyard and have large doors leading to a garden patio with LLoyd Loom garden chairs to kick back and relax. These rooms have a contemporary, airy feel with comfy sofa and coffee table. There is an private bathroom with a bath and shower, and locally made Pure Lakes bath products. Rooms include a flat-screen TV and complimentary tea, coffee and water tray. The cozy 1st floor Lakeland double bedded rooms with attached bathroom feature a bath and shower, and locally made Pure Lakes bath products. Rooms include a flat-screen TV and complimentary tea and coffee tray. Both rooms enjoy glimpses of the lake. Please note one of these rooms has a step in the bathroom. These spacious twin bedded Garden Rooms are just a short stroll across a small courtyard and have a large door leading to a garden patio or a lake view balcony with Lloyd Loom furniture to kick back and relax. These rooms have a contemporary, airy feel with comfy sofa and coffee table. There is an private bathroom with a bath and shower, and locally made Pure Lakes bath products. Rooms include a flat-screen TV and complimentary tea, coffee and water tray. Single bedded rooms with shower and locally made Pure Lakes toiletries. One on the first floor overlooking the courtyard and one on the second floor with lake view. Features also include a flat-screen TV and complimentary tea and coffee making facilities. Please note only one of these rooms can accommodate pets. The cozy 1st floor twin bedded rooms with attached bathroom feature a bath and shower, and locally made Pure Lakes bath products. Rooms include a flat-screen TV and complimentary tea and coffee tray. Tastefully furnished double bedded rooms with a side view of the lake. Rooms are en suite with a bath/shower and locally made Pure Lakes bath products. Rooms include a small comfy sitting area, flat-screen TV and complimentary tea/coffee tray. This spacious studio has a cozy sitting area and a patio window leading to a lake view balcony. It includes a private bathroom with a bathtub, walk-in shower and Pure Lakes bath products. The room is across from a small courtyard. This studio cannot accommodate pets. Tastefully furnished, this single room features an private bathroom with bathtub and shower and locally made Pure Lakes bath products. Please note that the ceiling in part of this room is less than 6 feet high. First-floor king-size double room with a view of the lake. An en-suite with bath/shower and locally made Pure Lakes bath products is also provided, alone with a seating area and complimentary tea/coffee tray. First-floor king-size double or twin bedded room with small seating area and complimentary tea/coffee tray. An en-suite with bath/shower and locally made Pure Lakes bath products is also provided. 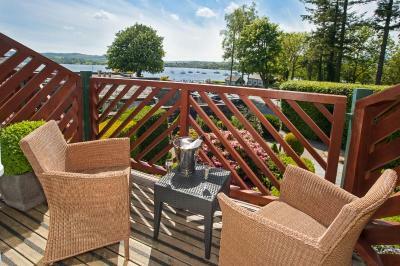 Located across a small courtyard, this spacious king-size double room with sofa and patio windows leading to a balcony with views of the lake. An en-suite with bath/shower and Pure Lakes bath products and a complimentary tea/coffee tray are also provided. Please note that this room cannot accept pets. House Rules Wateredge Inn takes special requests – add in the next step! Wateredge Inn accepts these cards and reserves the right to temporarily hold an amount prior to arrival. Please note, not all rooms can accommodate pets. This is subject to availability and and prior approval from the property owners. An additional charge of GBP 15 per dog per stay applies. A maximum of 2 dogs are allowed. Nothing we didn't like. Keep doing what you're doing. Breakfast was excellent. Room very clean. All staff very friendly and helpful, they couldn't do enough for us, was made to feel relaxed and welcomed. Loved the section of the bar reserved for residents priority ordering - what an excellent idea. Close to road. Some noise. Excellent staff. Very clean. Good decor. The room was too hot and the bed was a bit narrowed. The location is perfect with good parking space. The restaurant is right next to the lake with a great view. The staff was friendly. Breakfast was delicious. We would like to have seen the live music, but dogs were not allowed in that area. Lovely hotel in great surroundings. Good facilities, good food, very dog-friendly. We will definitely go back. Spotlessly clean, lovely accommodation and staff fantastic particularly Maria, she is fab! Very friendly staff, delicious food. Great location on the edge of the lake. 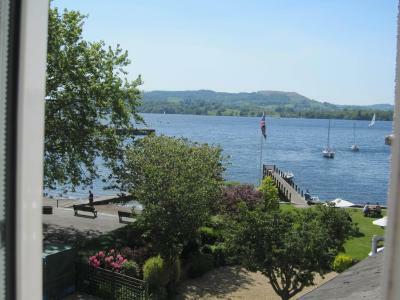 Good sized single room with fantastic views over Windermere. I really liked the way the tables in the ‘Snug’ were reserved for guests - it was quieter here than in the main bar and there was priority service. The food came super quickly in the evenings and at breakfast this morning - all really good and great value main courses. Breakfast was bespoke and freshly cooked - with an amazing view. Modern fresh clean room and bathroom. Interesting quirky building. Priority food ordering for guests. Plenty of guest parking. as residents we were supposed to be given priority when ordering food but dessert took half an hour to be served also had to wait for breakfast when other people were served theirs. excellent location.staff were very attentive nothing too much trouble.room spacious and clean. The bed was on a slight slope which was not the best for my partner's back but was otherwise OK.
Great location, good food and drink, lovely larger-than-average room, friendly staff.